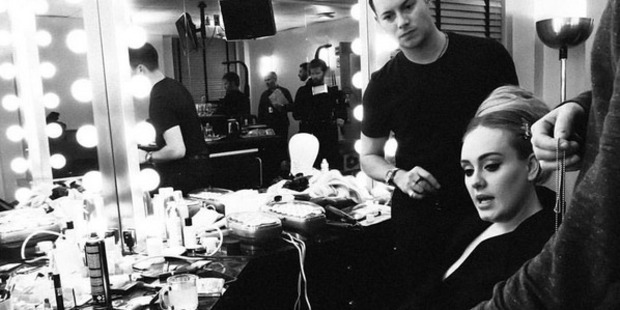 Adele's loyal makeup artist couldn't have asked for a bigger birthday bash. Kiwi man Michael Ashton was sung Happy Birthday by the 15-time Grammy-award winner and the 45,000-strong audience at last night's show in Mt Smart Stadium. Adele told the crowd Ashton has been her makeup artist for 10 years. "He has been my makeup artist since day one. His name's Michael Ashton and he's Kiwi. He was born in Hamilton. "It's his birthday today. I know that all of his family are here. Do you want to sing Happy Birthday to Michael?" Adele fans and the pop star then erupted into a rendition of Happy Birthday! Ashton became Adele's makeup artist at the start of her career. They were introduced through a mutual friend. "I popped over to her house to trim her fringe and she asked if I could do a quick bit of eyeliner for her before she went to meet friends," he told The Cut. "The eyeliner obviously got the seal of approval and the rest, as they say, is history. "Adele has beautiful almond-shaped eyes and fantastic natural bone structure, which is the perfect canvas to work with, so at the beginning it was always about making the eyes a focus feature." The key to Adele's cat-eye was "product cocktailing", Ashton revealed. He works the liner right into the root of the lashes, building the thickness gradually, and finishes by winging out at the end. Doing Adele's hair and makeup was always a collaborative process, he said. "We have worked together for so long now that we have our own memory bank of references to work from, so it might be 'let's do classic liner, but with the shimmer through like we did on SNL and just lip balm'. "It's brilliant because we know we are both reading from the same page, so to speak." When Ashton was 19 he won the New Zealand Young Protege scholarship for hairdressing. This article originally appeared at nzherald.co.nz and was published here with permission.